Convert Your Pilot License to an EASA Private Pilot License! Get started on converting your ICAO or FAA pilot license to an EASA Private Pilot License (PPL) quickly and easily by learning the knowledge and concepts you need to know to pass the two required EASA written exams; Airlaw and Human Performance. You can take this web-based course on your iPhone, iPad, PC or Mac. You'll have one (1) year access to the course upon completion of the last test question in the course. You'll be completely prepared to take both the EASA Airlaw and Human Performance Exams—the required EASA exams you need to pass to convert your FAA or ICAO pilot license into an EASA Private Pilot License (PPL). You'll have one (1) year to access all the course information upon completion of the last test question in the course. The EASA PPL Conversion Course, developed by E-gle—a team of experts from an EASA Approved Training Organization (ATO), thoroughly covers all the subject areas that you need to know in a fun and easy to understand presentation. The course features dynamic visual training materials with over 200 EASA exam-style questions—all with clear explanations. You'll ace your written tests in no time. You'll be able to convert any FAA or ICAO pilot certificate; even an ATP to an EASA PPL! You must take and pass both the EASA Airlaw and EASA Human Performance Exams at the private pilot level. Once you pass both exams, you should be endorsed by an ATO to take the Private Pilot Practical Skill Test (Practical exam with an EASA flight examiner). The Approved Training Organization (ATO) may require you to perform some practical training before being recommended for the skill test (Practical). Once you have answered all the questions in course, you will have one year to access and review the course. What pilot certificate am I eligible to convert to an EASA PPL once I complete the course and the testing process? You can convert any FAA or ICAO pilot certificate; even an ATP! What is the process to convert my pilot's license? Do I need a course completion certificate to take the EASA Airlaw and EASA Human Performance Exams? The EASA authority where you take the written exam may ask you to provide the course completion certificate. The ATO responsible for recommending you for your EASA practical skill test may also request your course completion certificate. Where can I take the EASA written exams? 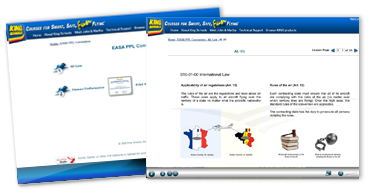 The written exam can be taken at any EASA authority. Currently, those testing authorities are located only based in Europe and there is no website listing all the testing centers. We recommend conducting an internet search for an EASA authority located in the country where you would like to sit for your exam. Does King Schools guarantee I'll pass my EASA Exams? No, but we do provide our standard 30-day money-back satisfaction guarantee. Unlike the FAA, EASA does not issue a testing result if an exam is failed, but you will have multiple attempts to pass. Because of the way EASA tests, failing on the first attempt occurs much more frequently than with FAA tests. It is common enough that EASA has special rules in place for retesting. Since you need to pass two exams, here is how those rules would apply to you. An applicant has 4 attempts to pass one exam, or if they fail to pass both exams, they are given 6 attempts to re-take both exams within a period of 18 months. Applicants have up to 18 months to take the second test - the 18 month period starts at the end of the calendar month from the date of the first test. Unless otherwise determined, an applicant has successfully completed the required exams when he/she has passed all the required examination papers within a period of 18 months counted from the end of the calendar month when the applicant first attempted an examination.